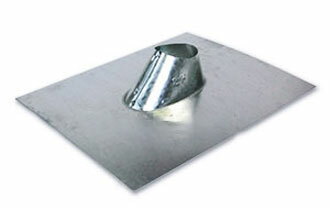 PRODUCT: 2" GALVANIZED ADJUSTABLE ROOF PIPE FLASHING (IP JACK). Riser Opening: 2" wide, Base Size: 11 x 13". OPTIONS: Available in aluminum. Other sizes available to fit pipes 1/2 to 6" pipes, and ventilation pipes up to 20".